The 39.4 metre motor yacht Mac Brew has been listed for sale by Thom Conboy and Rytis Babravicius atOcean Independence. Designed by Omega Architects and built in aluminium by Dutch yard Heesen Yachts to ABS class and MCA protocols, Mac Brew was launched in 2002 and refitted in 2008. She has had an excellent charter history thanks to her versatile layout and has been maintained to the highest standards. 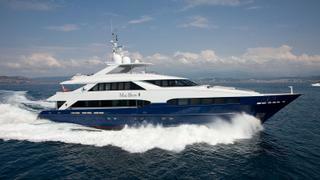 Accommodating 12 guests in six cabins, Mac Brew offers many of the features of a much larger yacht. All cabins on this yacht for sale have entertainment centres, television screens and en suite bathroom facilities. Her aft facing, full beam master stateroom dominates the bridge deck with panoramic views and a private terrace accessible through floor to ceiling glass doors. The main deck features an enclosed 'winter garden' on the aft deck leading into the comfortable family saloon and dining area. Forward is a large media and cinema room, which can double up as a children’s playroom. Exterior spaces are extensive and include a large sundeck offering fantastic sunbathing areas alongside a Jacuzzi spa pool and al fresco dining options. Twin 2,720hp MTU diesel engines allow a cruising speed of 14 knots, a maximum speed of 24 knots and a range of 3,000 nautical miles. Lying in Olbia, Italy, Mac Brew is asking €5,595,000.